Get free advice and estimates from plumbers in your city. 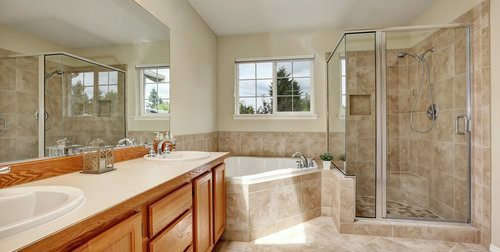 Bathtubs are a fantastic addition to any bathroom, giving you the ability to relax, unwind, massage sore muscles, and bathe young children or pets. Tubs come in many different shapes, sizes, configurations, and styles. Among these are two installation types – freestanding tubs and built-in, alcove-style tubs. Both have their positive attributes that can make them an attractive option. We will outline the differences between them below so that you can make a more informed decision for your home. Alcove tubs are built into your bathroom, typically with a surround of some kind, meaning that they will have at least two walls bracketing the tub. Many alcove tubs have three walls – two short walls and a long wall across the back. However, alcove tubs can be installed in corners and may abutt or adjoin a shower on one side. They may have a panel front that is decorative or plain in style, and the surround or backsplash may be tiled in a variety of materials, styles, and colors, making an alcove more customizable to your bathroom. While the typical alcove tub is about 5-feet in length, they can range in size from 4 feet to 6 or even 7 feet for some larger, two-person tubs. Freestanding tubs come in numerous shapes, sizes, and materials as well. They can be made of stone, metal, or acrylic and can range in size from 5 to 6-½-feet in length. They may be contemporary, built on a heavy base, or they may be traditional with a slipper or roll-top design. Some traditional freestanding tubs are designed to be painted or finished on the exterior, but many are not. Freestanding tubs are meant to be walked around on all four sides. For this reason, they require more space in the bathroom than an alcove tub of the same size. However, because they can be placed anywhere and do not need the presence of a water wall, they give you more flexibility in how your bathroom is laid out. Alcove tubs must be installed flush against a wall. This can be space-saving for small bathrooms but limits how the rest of the room can be laid out. The installation and its requirements for the tub largely depend on the type of tub, its function, and the material it is made of. For an alcove tub, installation often takes longer and costs more than the tub itself due to the process. When a tub is in an alcove, it will have a water wall, which is a wall with plumbing concealed inside. The area is plumbed first, then the tub is set and caulked in place, the drain installed, the flange put on, and then the alcove finished, which takes several hours all together. A freestanding tub, however, needs little to no installation beyond the plumbing. The tub filler is the biggest installation expense because it must be brought up from the floor or installed in the ceiling. For floor fillers, this requires finishing the floor around the extending pipes. Both types of tub must be installed by a professional. There are many variables involved that can impact installation, from floor reinforcement and where the tub filler is located to whether or not the tub requires leveling 1. Using a motor for a jetted tub will also increase labor costs. There is an enormous range of costs associated with both freestanding and built-in 2 tubs. Both come in different sizes, depths, materials, and functions, which greatly influence costs. For the purposes of this guide, we assume that the average homeowner wants to install a 5-foot soaking tub made of acrylic in their bathroom. For a built-in tub, a 5-foot, 18-inch deep acrylic soaking tub costs around $350. Installation costs around $1,000, for a total of about $1,350. A freestanding, soaking tub measuring 5-feet costs around $650. Installation is easier and costs around $550 for the plumbing. A standard soaking tub without feet or a platform requires no special installation, making the total around $1,200. There are many other variables, however, that can influence the final cost of the project, including the type of surround used, the material of both tubs, and whether you use a jetted tub or soaking model. The maintenance of the tub is determined by several factors, including its material, size, and function. Jetted tubs require more maintenance than soaking tubs, while stone or copper tubs require special cleaning supplies. Alcove tubs that have a built-in shower have more wall space to clean than freestanding tubs. However, if the shower has a handheld or removable showerhead, then the tub may be easier to clean. 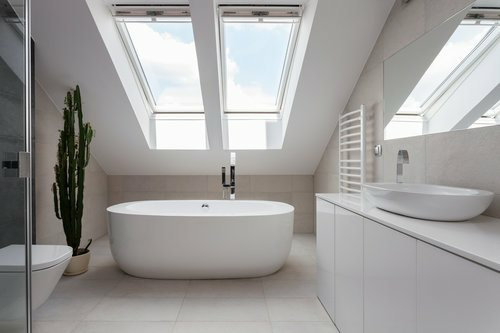 Freestanding tubs do not have walls to maintain, but the exterior of the tub may require cleaning in addition to the interior. And because most do not have a handheld shower attachment, cleaning may be more difficult. Any tub made of cast iron, steel, or natural stone will be heavier than a tub made of acrylic or fiberglass. Both styles of tub come in different materials that may mean you need to reinforce your floor. Very large stone, freestanding tubs require a floor that can hold up to two tons when the tub is filled. This may mean installing a new, reinforced subfloor, particularly in older homes. An acrylic freestanding tub, however, will not require any new flooring, while a new cast iron alcove tub may need some reinforcement. To determine if your floor requires adjustment, you need to have a structural engineer examine it, taking into account both the weight of the unfilled tub and the weight of the same tub filled with water. Alcove tubs tend to be used as tub and shower combinations, unless they abutt a shower enclosure and are used separately. Alcoves are easiest to create in a tub/shower combination, however, some clawfoot tubs may also be used in this way. The key to using a freestanding tub as a shower is to have exposed pipes running from the floor to a showerhead that contains a curtain ring. This can safely contain the water and allow you to use the freestanding tub as a shower as well. Alcove tubs are framed with walls, which means that they can contain shelves, niches, shower baskets, and more storage items. Alcove tubs also frequently have enough of a ledge or deck to allow for bottles and soaps to be stored there. Freestanding tubs often have a rolled top or edge that does not allow for storage, and because they are often located in the center of a room, they have fewer options for shelving or niches. 1 Leveling: The process of evening out the ground's surface, making it either flat or sloped. How much does it cost in my city? Cost varies greatly by region (and even by zip code). To get free estimates from local contractors, please indicate yours. An item of furniture, such as a bookcase or set of cabinets, that is built directly into the structure of the room. 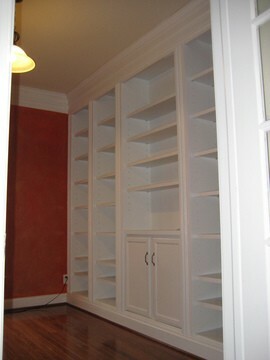 Built-ins are therefore customized to the room and not detachable. Cost Considerations: Built-in furniture generally costs more than freestanding furniture because it has to be designed and built specifically for each customer. Since every built-in project has to be customized to the home and the homeowner's specific requirements, it is best to get quotes from a few professionals to get a good idea of what a certain project will cost.